"For God so loved the world, that he gave his only begotten Son, that whoever believes in him should not perish, but have everlasting life." "Sin" means missing the mark. It is failing to meet God's standard of how we should live. "Repentance" means to turn away from sin to follow God's new direction for your life. "Confess" means to agree with God about your sinful condition. "Believe" is to trust Jesus as your substitute, and "call" is to ask him for his forgiveness, hope and eternal life. Dear God, I know that Jesus is your Son, and that he died on the cross and was raised from the dead. I also know that I have sinned and am in need of forgiveness. I am willing to turn from my sins and accept Jesus as my Savior and Lord. 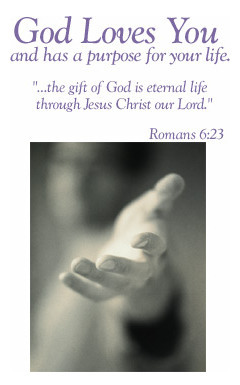 Thank you for giving me forgiveness and eternal life through your Son. In Jesus' name, amen. He heard your prayer, and you are a member of God's family. In I Corinthians 3:1 the Bible calls new Christians "babes in Christ" Without the essentials of life, babies will not develop normally. The church is to a new Christian what the home and family are to a new baby. Therefore, you need to follow through with your decision by being baptized and uniting with a church. In God's church, you will find new Christian friends and grow in your new life in Christ. To find a church in your area, click here.